Please report any broken links or trouble you might come across to theWebmaster. 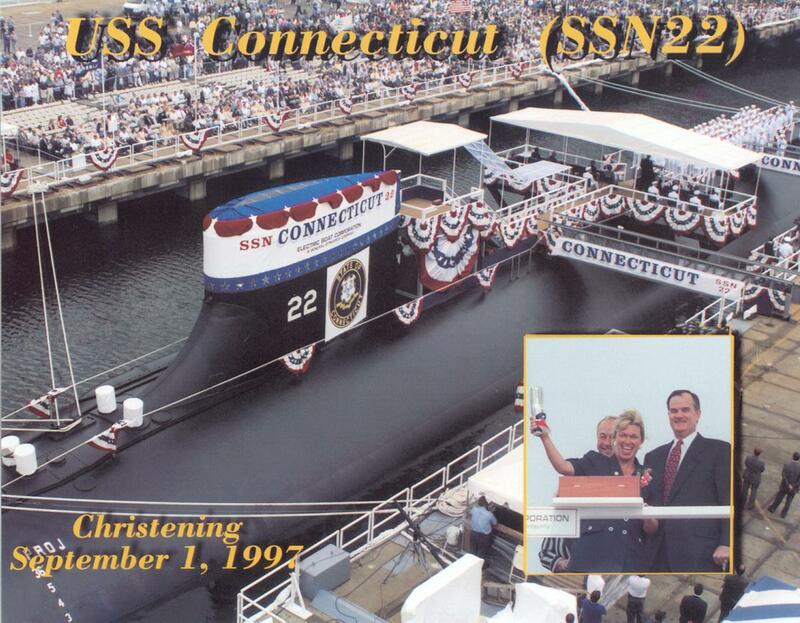 Seawolf Class Attack Submarine: Laid down at the Electric Boat Division of General Dynamics Corp., Groton, CT.; Launched, 1 September 1997; Commissioned, USS Connecticut (SSN-22), 11 December 1998; Connecticut is assigned to the US Atlantic Fleet, and is homeported at Groton, CT. Specifications: Displacement, Surfaced: 7,460 t., Submerged: 9,137 t.; Length 353'; Beam 40'; Draft 35'; Speed, Surfaced 25 kts, Submerged 35 kts; Depth limit 1,600'; Complement 133; Armament, eight 660-mm torpedo tubes, 50 Tomahawk cruise missiles or 50 Harpoon antiship missiles or 50 MK-48 ADCAP torpedoes or 100 mines; Propulsion System, One S6W reactor, one shaft at with 52,000 shp with pumpjet propulsion, Improved Performance Machinery Program Phase II one secondary propulsion submerged motor. 59k Connecticut (SSN-22) underway off the coast of New England during her sea trials, circa 1997-98. Courtesy of General Dynamics and Electric Boat. 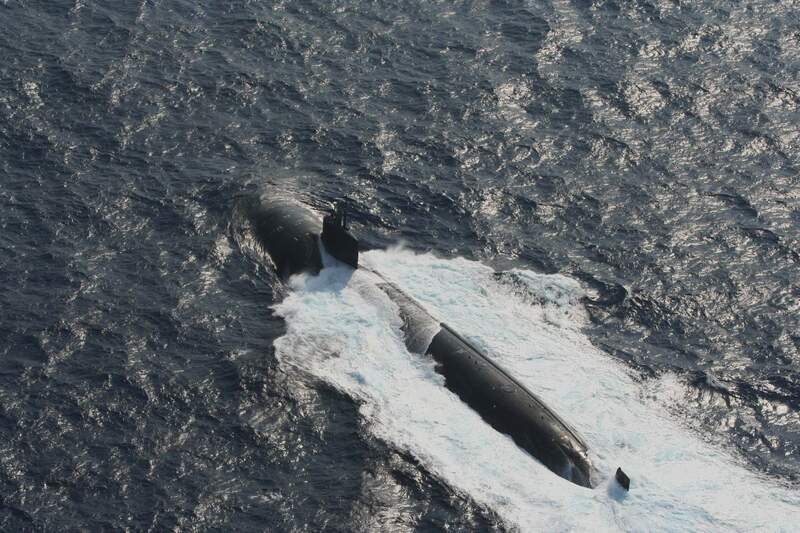 59k Bow on view of the Connecticut (SSN-22), underway off the coast of New England during her sea trials, circa 1997-98. Courtesy of General Dynamics and Electric Boat. 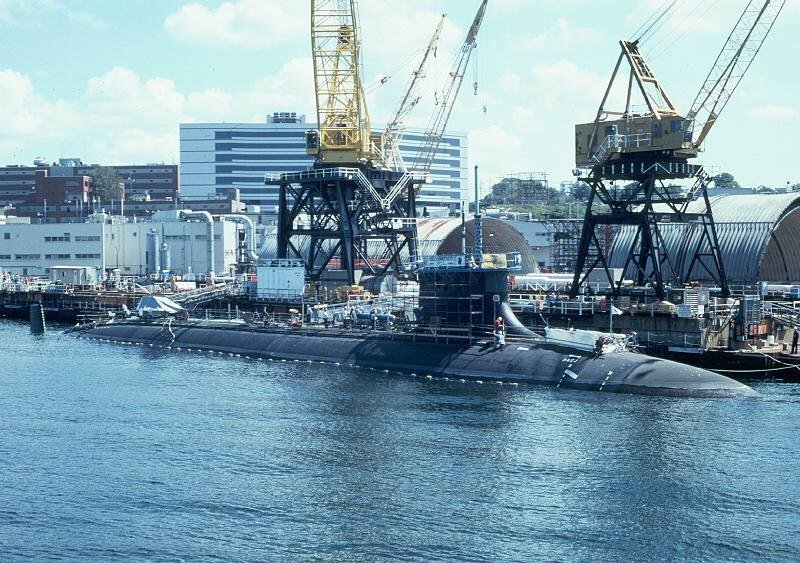 148k Connecticut (SSN-22), at the Electric Boat Division of General Dynamics Corp., Groton, CT., 25 August 2000. © Richard Leonhardt. 600k Captain Robert E. Clark II sea tours include assignments on board Batfish (SSN-681) as a division officer and Combat Systems Officer, during which time he was named Batfish's 1988-89 Junior Officer of the Year; Navigator and Operations Officer aboard Dallas (SSN-700), after receiving the David Lloyd Award for Tactical Excellence while attending the Submarine Officer Advanced Course; Submarine Operations Officer for Commander Cruiser Destroyer Group EIGHT (COMCRUDESGRU 8), including support of an emergent deployment to Haiti as part of Joint Task Force 120 (Operation Support Democracy); and Executive Officer aboard Grayling (SSN-646) and Hampton (SSN-767). 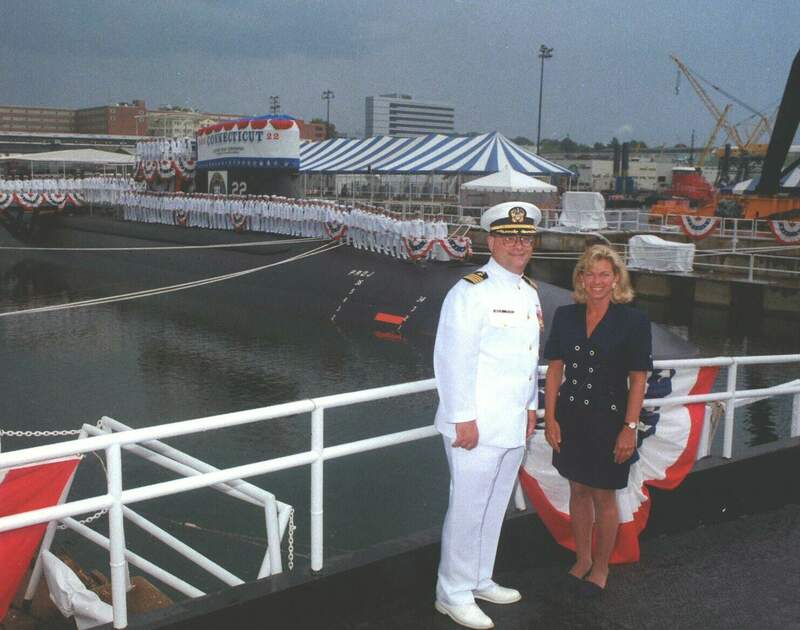 Captain Clark commanded Connecticut (SSN-22) from August 2001 through September 2003. 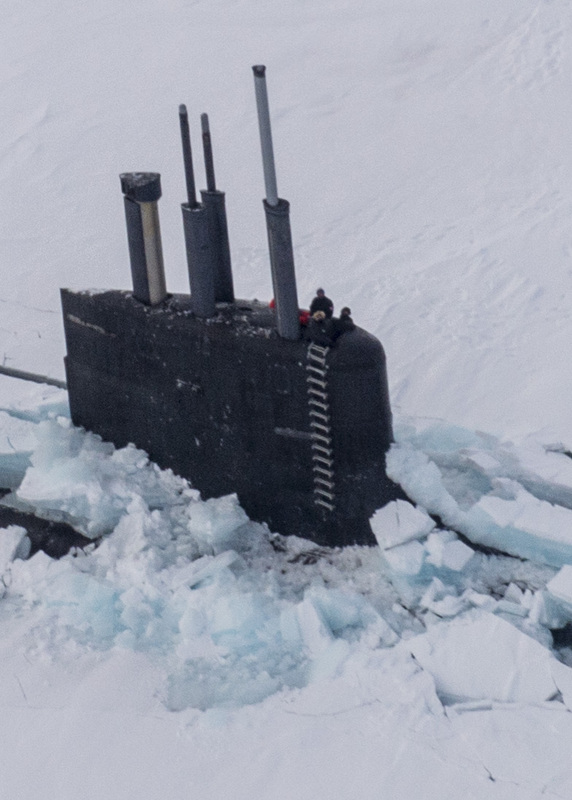 Under his command Connecticut completed two operations under the Arctic ice pack (LANTSUBICEX 1-02 and 1-03), as well as the ship's highly successful inaugural deployment to the North Atlantic. 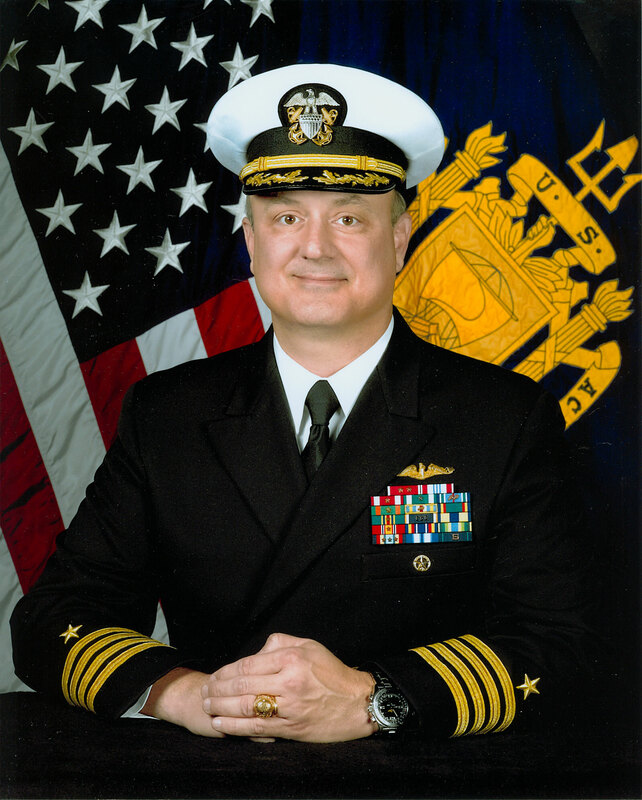 During his tour, Connecticut was awarded consecutive Submarine Squadron FOUR Tactical "T's" in recognition of tactical and operational excellence in 2001 and 2002, several Retention Honor Roll awards, and back-to-back unit awards recognizing Connecticut's performance during operations of significant importance to the National Security of the United States while deployed to the North Atlantic and Arctic. Of note, these were the first unit awards presented to a Seawolf Class submarine. Photo courtesy of Bill Gonyo. 80k Connecticut (SSN-22) crewman prepare to cast off all lines as she departs on her first scheduled deployment, 1 May 2002. USN photo by Woody Paschall, JOSA, USN, contributed by Steven A. Cardali, USN, CA35. 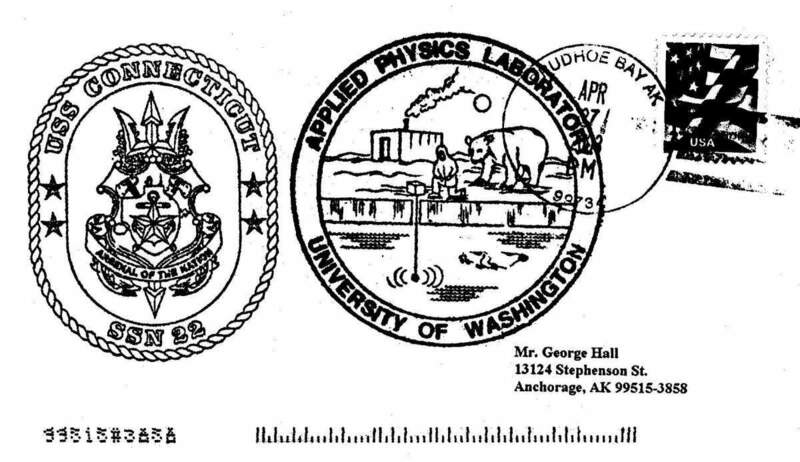 126k Commemorative postal cover issued on the occasion of the Connecticut (SSN-22) & the Applied Physics Laboratory at the University of Washington, April 2003. Courtesy of Jack Treutle (of blessed memory). 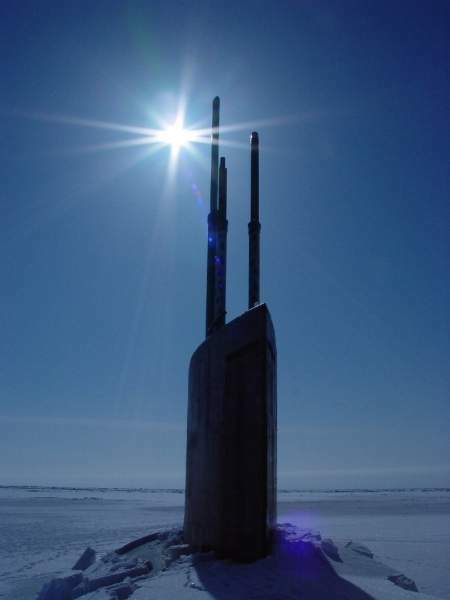 140k Mid-day sun shines over the sail of the Connecticut (SSN-22), at the APLIS 2003 Ice Camp, April 2003. Courtesy of csp.navy. 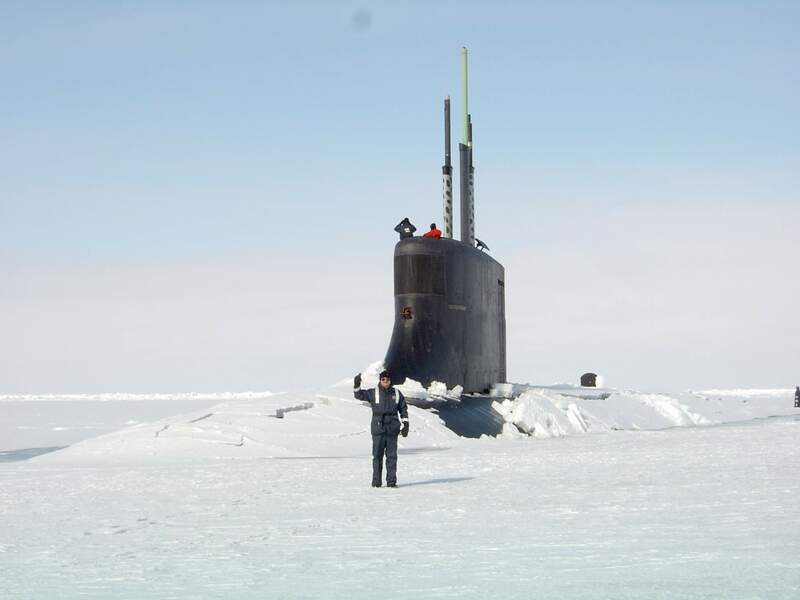 130k CDR Bob Clark of the Connecticut (SSN-22), gives the thumbs up at the North Pole, May 2003. Courtesy of Jack Treutle (of blessed memory). 24k What, no fire hydrant! 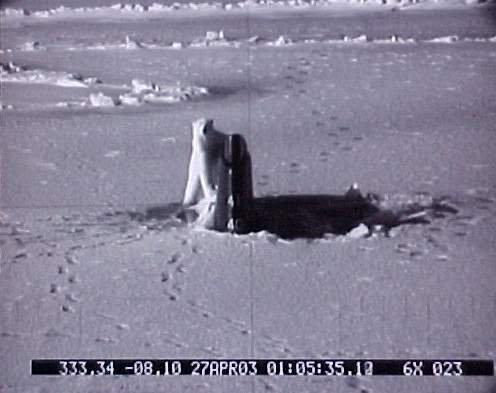 The Connecticut's (SSN-22) rudder will have to do at the APLIS 2003 Ice Camp, April 2003. Courtesy of csp.navy.Text correction courtesy of David Gornish. 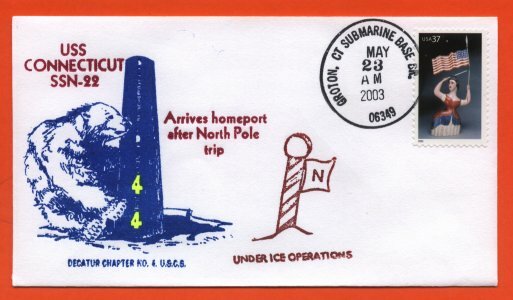 36k Commemorative post mark of the Connecticut (SSN-22), arriving home from the North Pole, 23 May 2003. Courtesy of Jack Treutle (of blessed memory). 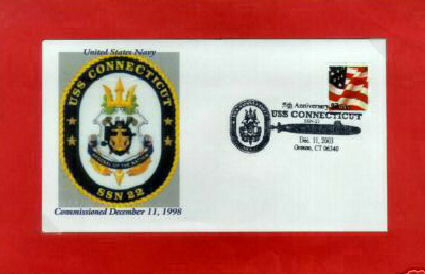 24k Commemorative post mark on the occasion of the Connecticut's (SSN-22), 5th year in commission, 11 December 2004. Courtesy of Jack Treutle (of blessed memory). 126k How's the water? 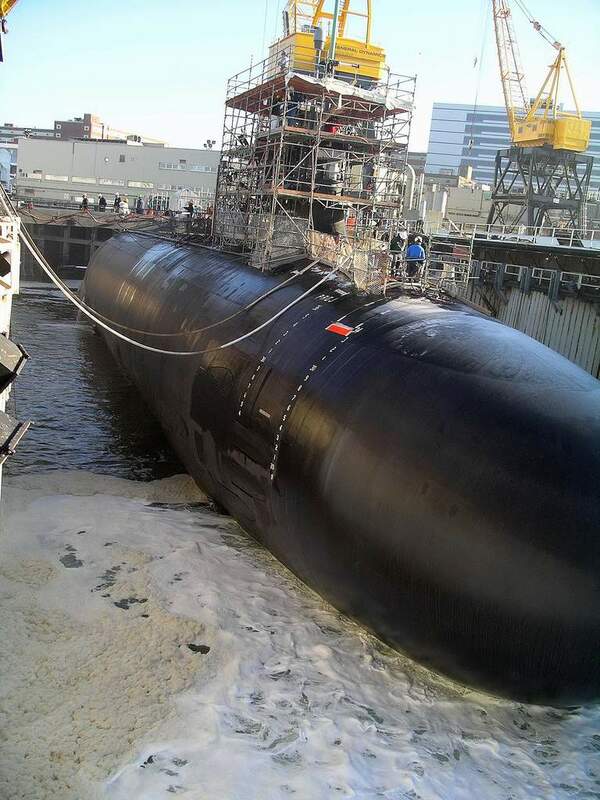 The drydock starts to fill for the Connecticut (SSN-22) during her undocking day in early 2006. Photo courtesy of LT. Tyler Cameron & submitted by Bill Gonyo. 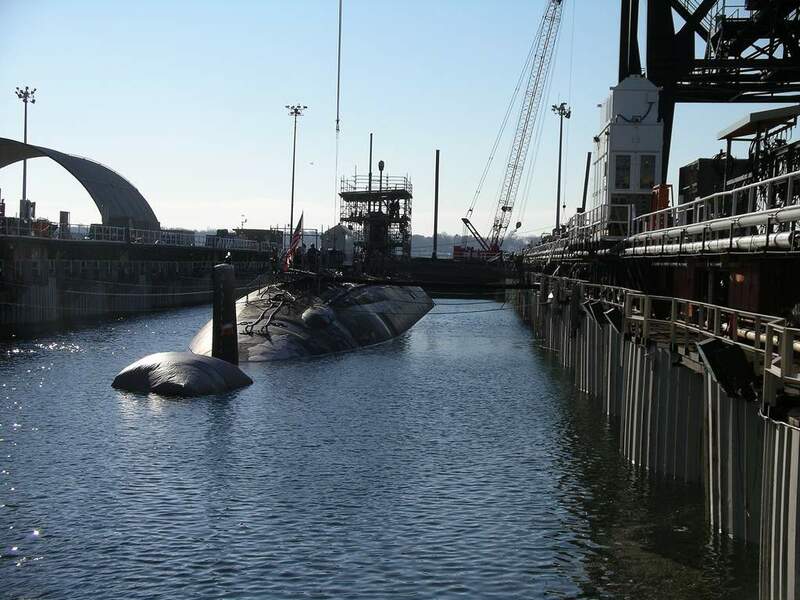 181k Connecticut (SSN-22) refloated for the first time in a year. Photo courtesy of LT. Tyler Cameron & submitted by Bill Gonyo. 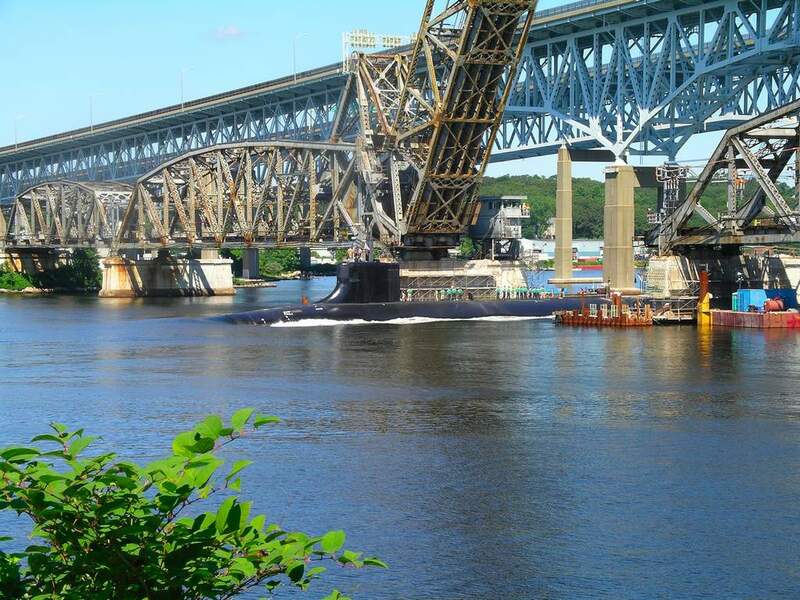 159k The Connecticut (SSN-22) navigating the Thames River in July 2006. Photo courtesy of LT. Tyler Cameron & submitted by Bill Gonyo. 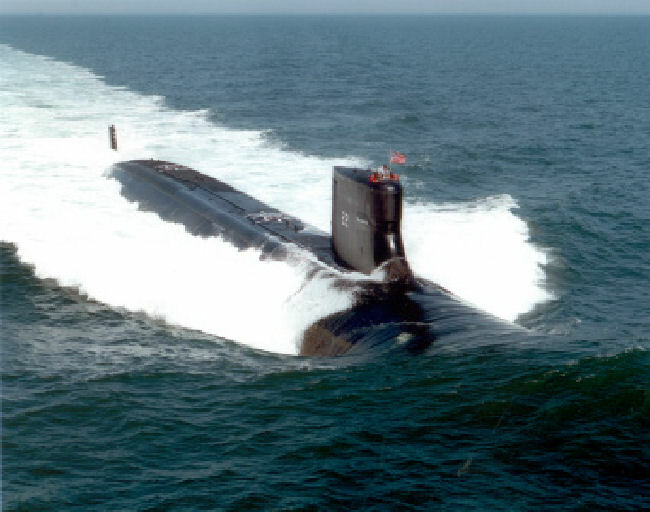 91k The Connecticut (SSN-22) heading out to sea in July 2006. Photo courtesy of LT. Tyler Cameron & submitted by Bill Gonyo. 172k An aerial view of attack submarine Virginia (SSN-774), bottom, and fast attack submarine Connecticut (SSN-22), moored to the pier at Submarine Base New London on 2 February 2007. USN photo # N-8467N-001 by John Narewski, courtesy of navy.mil. 105k Cmdr. 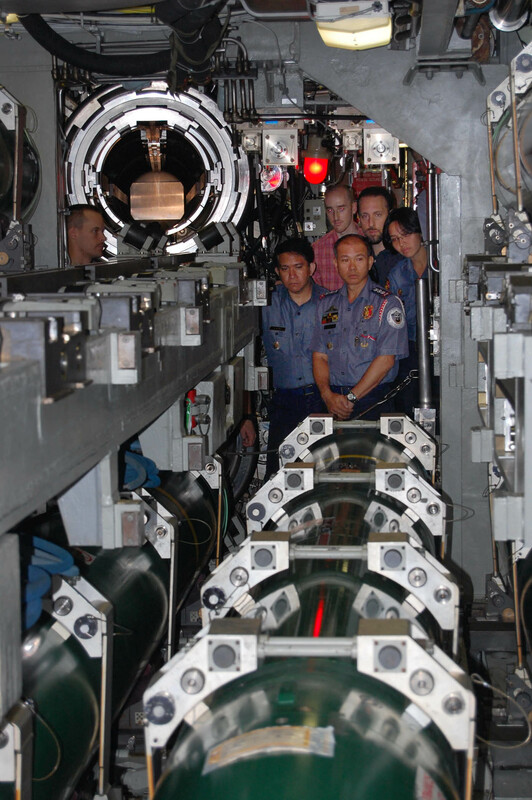 Daniel Christofferson, commanding officer of the fast attack submarine Connecticut (SSN-22), shows Miss Connecticut 2006 Heidi Voight the ship's periscope during a tour of the boat on 6 February 2007. USN photo # N-8467N-002 by John Narewski, courtesy of navy.mil. 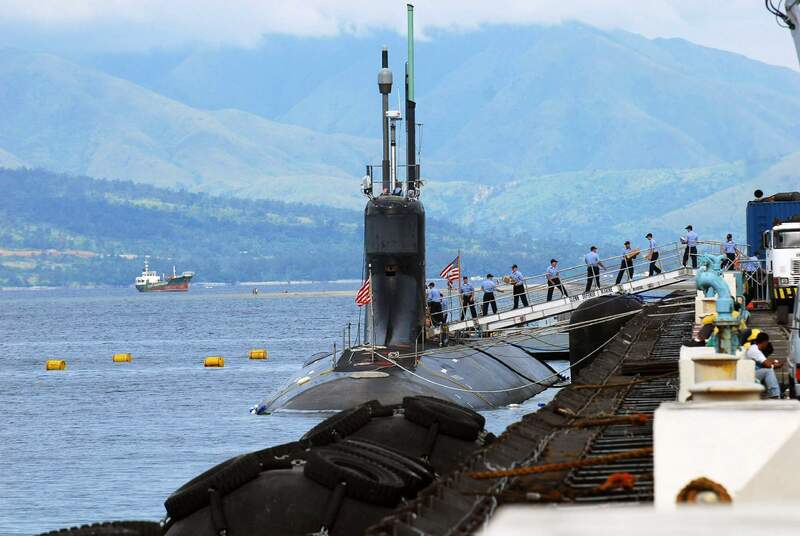 188k Sailors assigned to the fast-attack submarine Connecticut (SSN-22), load supplies onto the boat 29 October 2007 at Subic Bay, Republic of the Philippines. 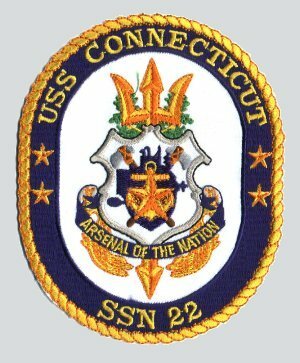 Connecticut is on a scheduled deployment to the U.S. Pacific Command area of responsibility. 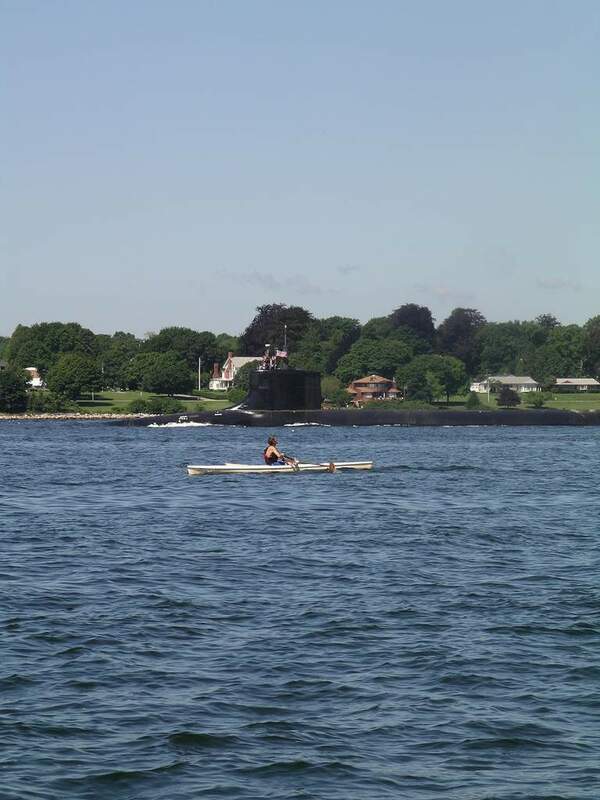 The submarine deployed from Groton, Conn., in July 2007, and will return to its her homeport of Kitsap, Wash., upon the completion of this deployment. 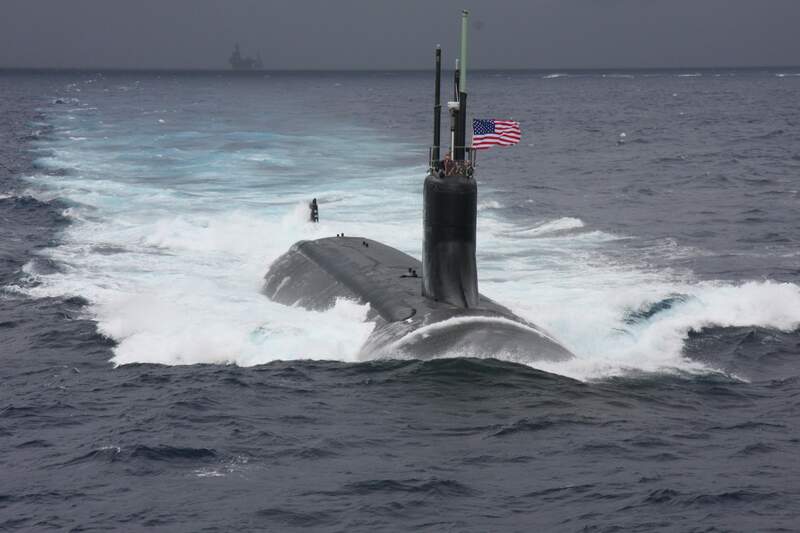 The homeport shift is part of the Navy's realignment of the fast-attack submarine force, with 60 percent of the force to be homeported in the Pacific Ocean. 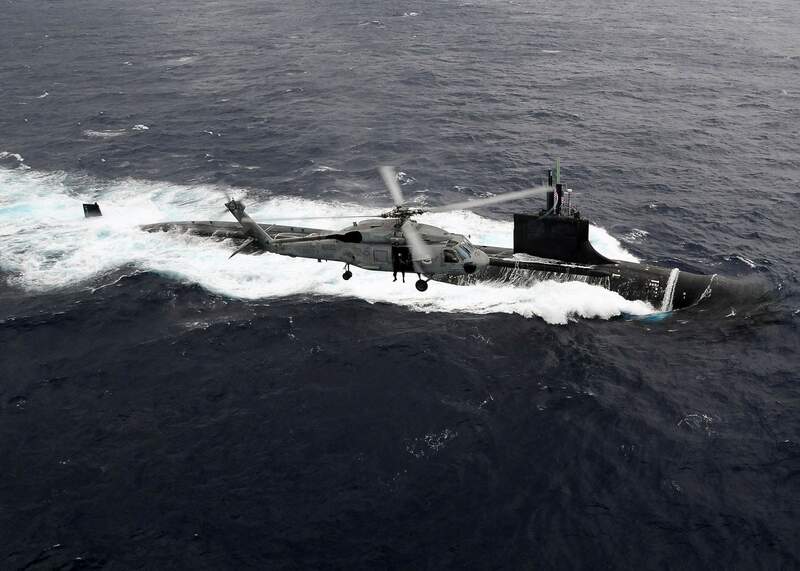 USN photo # N-0913B-032 by Mass Communication Specialist Seaman Andrew Brantley, courtesy of navy.news.mil. 407k Two Japanese Self-Defense Force P-3C Orion aircraft fly over Japanese and U.S. Navy vessels during a group photo exercise while under way in the Philippine Sea 16 November 2007, at the conclusion of ANNUALEX 19G. 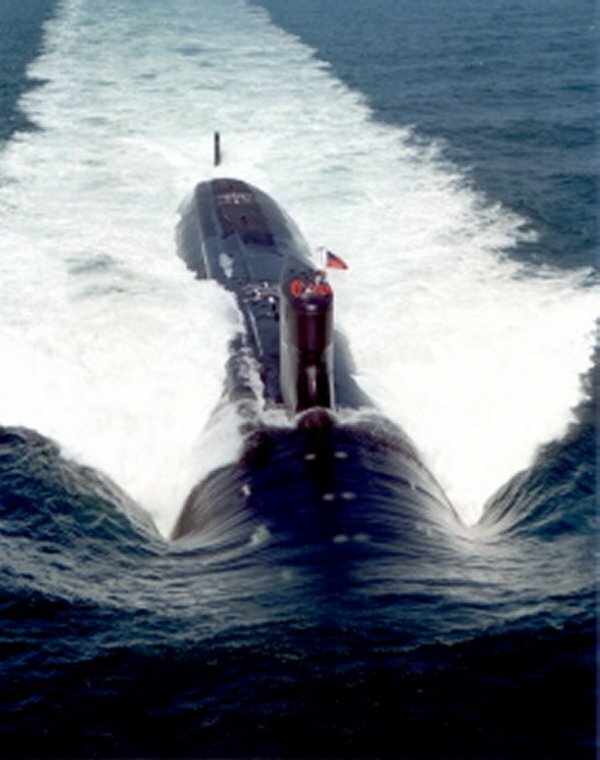 The Connecticut (SSN-22) is to the starboard side. DOD photo # N-7883G-079 by DoD photo by Mass Communication Specialist Seaman Kyle D. Gahlau, courtesy of jccc.afis.osd.mil. 657k Connecticut (SSN-22) looking very much like the waters of the Philippine Sea minus the foam on 16 November 2007, at the conclusion of ANNUALEX 19G. Photo courtesy of LTJG Chris Stevens, HS-14. 289k The aircraft carrier George Washington (CVN-73) and the Connecticut (SSN-22) are underway in the Pacific Ocean as an HH-60H Sea Hawk helicopter from the Chargers of Helicopter Anti-Submarine Squadron (HS) 14 hovers nearby on 17 November 2009. 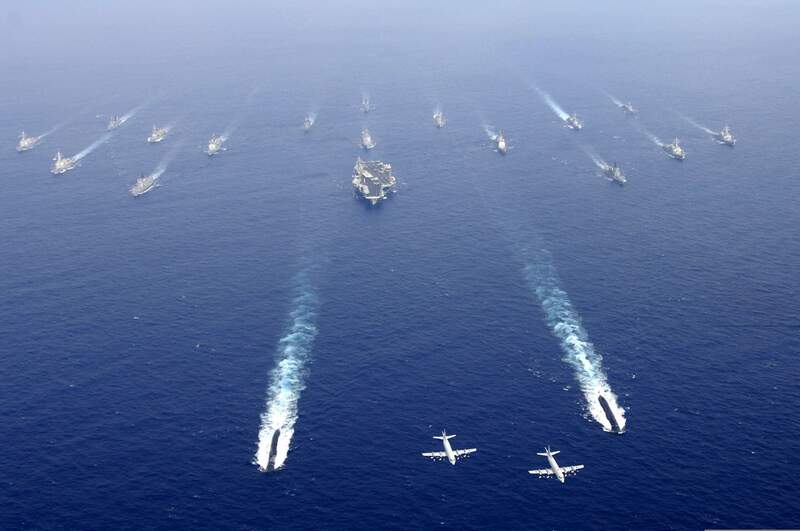 Ships from the U.S. Navy and Japan Maritime Self-Defense Force are participating in ANNUALEX 21G, a bilateral exercise designed to enhance the capabilities of both naval forces. USN photo # N-6720T-050 by Mass Communication Specialist Seaman Adam K. Thomas. 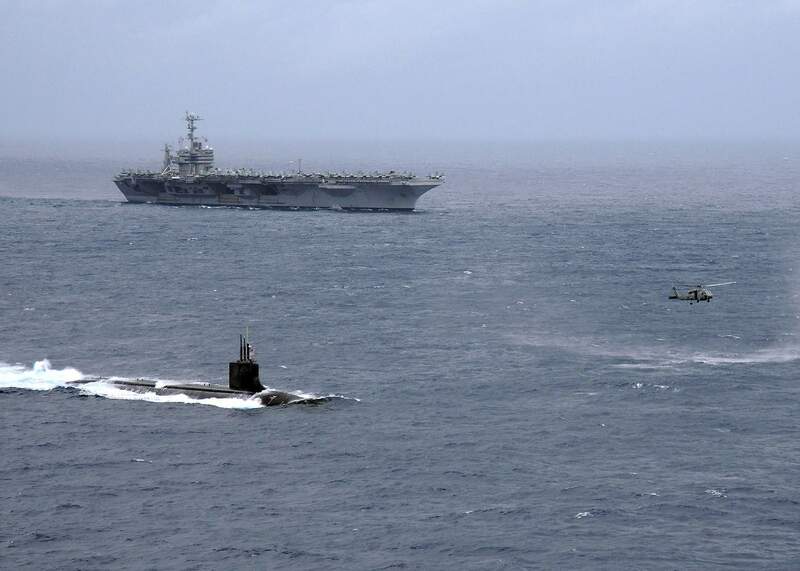 373k The Sea Wolf class attack submarine Connecticut (SSN-22) transits in front of George Washington (CVN-73) while an SH-60F Sea Hawk helicopter assigned to the Chargers of Helicopter Anti-Submarine Squadron (HS) 14 flies overhead during a 26 ship formation photo exercise. USN photo # N-1644H-168 by Mass Communication Specialist 1st Class John M. Hageman. 600k The fast-attack submarine Connecticut (SSN-22) leads a formation of American and Japanese ships East of Okinawa during a PhotoEX on the last day of ANNUALEX 21G. The Essex (LHD-2) can be seen on the horizon. Photo courtesy of LTJG Chris Stevens, HS-14. 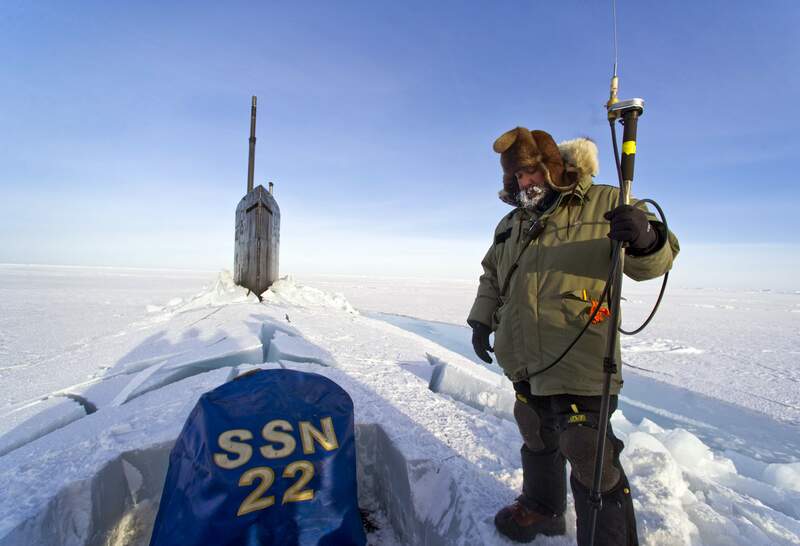 588k Hector Castillo watches daily operations while communicating with the command hut at the Applied Physics Lab Ice Station on 19 March 2011 as the Seawolf-class attack submarine Connecticut (SSN-22) prepares to submerge under the ice during ICEX 2011. USN photo # N-UH963-418 by Mass Communication Specialist 2nd Class Kevin S. O'Brien. 878k The Nimitz-class aircraft carrier John C. Stennis (CVN-74) departs Naval Base Kitsap on 25 July 2011. 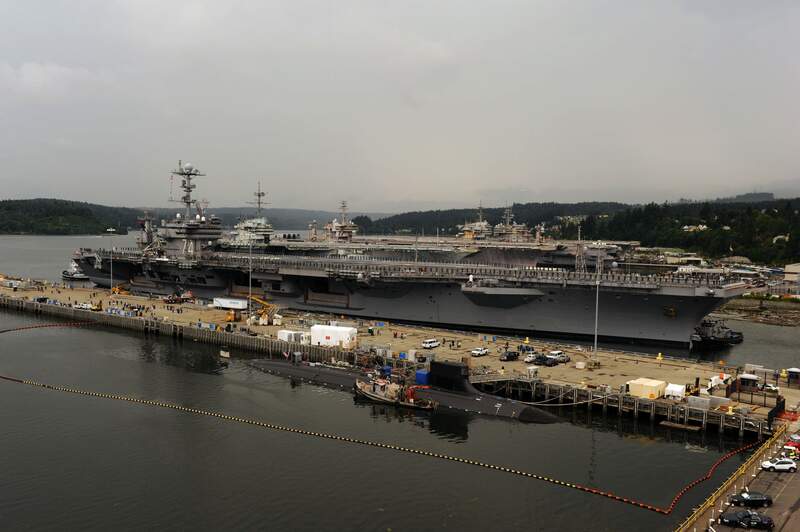 John C. Stennis is on its way to the western Pacific Ocean and the Arabian Gulf for a scheduled seven-month deployment. 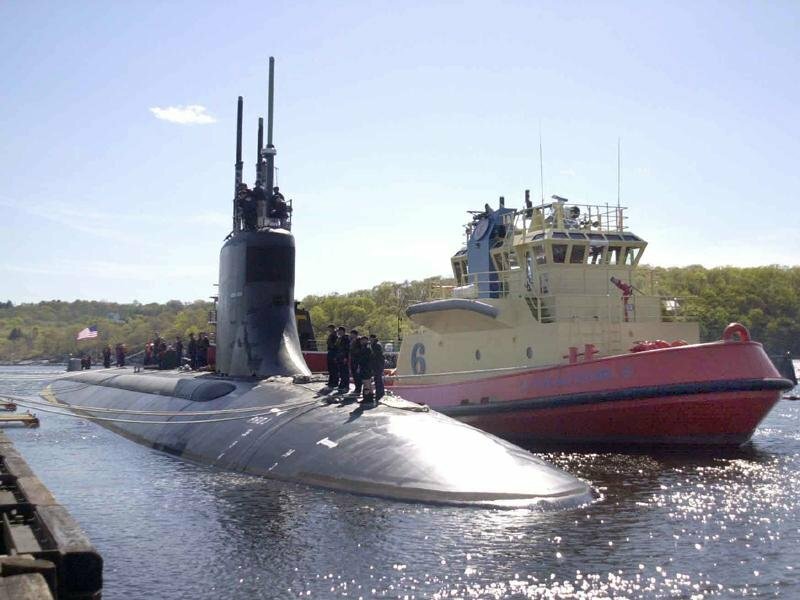 The Connecticut (SSN-22) is alongside. USN photo # N-RG482-030 by Mass Communication Specialist 2nd Class Kyle Steckler courtesy of navy.mil. via Ron Revees. 262k Connecticut (SSN-22) breaks through the ice during Ice Exercise (ICEX) 2018. ICEX 2018 is a five-week exercise that allows the Navy to assess its operational readiness in the Arctic, increase experience in the region, advance understanding of the Arctic environment, and continue to develop relationships with other services, allies and partner organizations. U.S. Navy photo 180307-F-SV928-154 by Airman 1st Class Kelly.